Begin creating your invoice as you would any other invoice. A CDS invoice type will NOT remove products from your inventory. Keep this in mind when creating the invoice. Did you import this order from intouch? If so, you will need to create a regular sale invoice so the products WILL be removed from your inventory. This invoice option is only for orders that you did not pay for yourself and did not import. 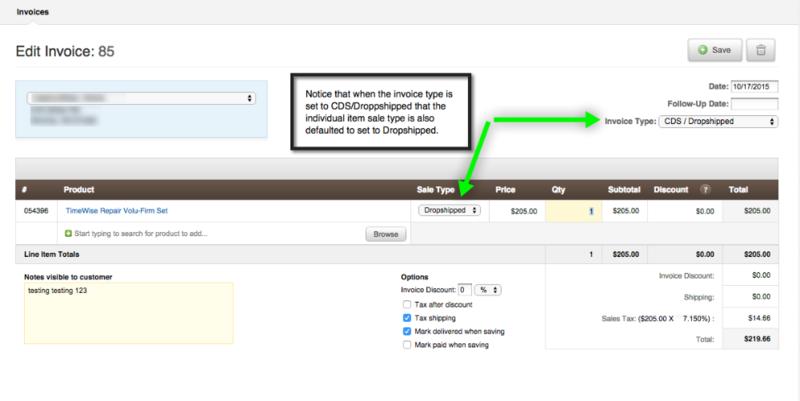 Choose the customer, date and set the invoice type as "CDS/Dropshipped." Invoices that are marked as "CDS/Dropshipped" will not be removed from inventory. So, if you import a CDS order you will need to create a regular sale ticket. If some of the items are CDS and some of them are not, you will need to create two tickets for that customer. Save the invoice and record payments as usual.